WP_Query Object ( [query] => Array ( [page] => [name] => yales-peabody-museum-showcases-stunning-rarely-seen-formations-of-california-gold ) [query_vars] => Array ( [page] => 0 [name] => yales-peabody-museum-showcases-stunning-rarely-seen-formations-of-california-gold [error] => [m] => [p] => 0 [post_parent] => [subpost] => [subpost_id] => [attachment] => [attachment_id] => 0 [static] => [pagename] => [page_id] => 0 [second] => [minute] => [hour] => [day] => 0 [monthnum] => 0 [year] => 0 [w] => 0 [category_name] => [tag] => [cat] => [tag_id] => [author] => [author_name] => [feed] => [tb] => [paged] => 0 [meta_key] => [meta_value] => [preview] => [s] => [sentence] => [title] => [fields] => [menu_order] => [embed] => [category__in] => Array ( ) [category__not_in] => Array ( ) [category__and] => Array ( ) [post__in] => Array ( ) [post__not_in] => Array ( ) [post_name__in] => Array ( ) [tag__in] => Array ( ) [tag__not_in] => Array ( ) [tag__and] => Array ( ) [tag_slug__in] => Array ( ) [tag_slug__and] => Array ( ) [post_parent__in] => Array ( ) [post_parent__not_in] => Array ( ) [author__in] => Array ( ) [author__not_in] => Array ( ) [ignore_sticky_posts] => [suppress_filters] => [cache_results] => 1 [update_post_term_cache] => 1 [lazy_load_term_meta] => 1 [update_post_meta_cache] => 1 [post_type] => [posts_per_page] => 10 [nopaging] => [comments_per_page] => 50 [no_found_rows] => [order] => DESC ) [tax_query] => [meta_query] => WP_Meta_Query Object ( [queries] => Array ( ) [relation] => [meta_table] => [meta_id_column] => [primary_table] => [primary_id_column] => [table_aliases:protected] => Array ( ) [clauses:protected] => Array ( ) [has_or_relation:protected] => ) [date_query] => [queried_object] => WP_Post Object ( [ID] => 4721 [post_author] => 1 [post_date] => 2018-04-20 20:13:05 [post_date_gmt] => 2018-04-21 00:13:05 [post_content] => One of the world's finest collections of California gold made its debut last Saturday at the Yale Peabody Museum of Natural History in New Haven, Conn. The exhibition features 23 natural formations of gold, some of which resemble leaves, coral and skeletons. The exhibition also gives Yale University an opportunity to remind visitors of the school's interesting connection to the California Gold Rush. Seven years before gold was discovered in the American River at Sutter’s Mill, Yale professor James Dwight Dana had completed a tour of California’s Sacramento Valley. A pioneering geologist and mineralogist, Dana identified the region as a potential source of gold, remarking that the rocks there “resemble in many parts the gold-bearing rocks of other regions: but the gold, if any there be, remains to be discovered.” The gold specimens and artifacts are on loan to the Peabody from The Mineral Trust. The collection had previously appeared at the American Museum of Natural History in New York City. Credits: Photos by Harold Moritz, courtesy of Yale University. 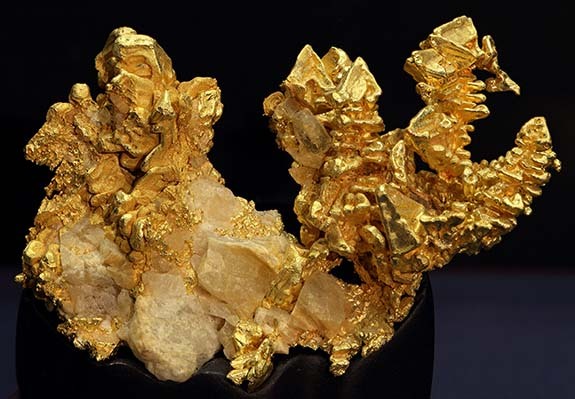 [post_title] => Yale's Peabody Museum Showcases Stunning, Rarely Seen Formations of California Gold [post_excerpt] => [post_status] => publish [comment_status] => closed [ping_status] => closed [post_password] => [post_name] => yales-peabody-museum-showcases-stunning-rarely-seen-formations-of-california-gold [to_ping] => [pinged] => [post_modified] => 2018-04-20 20:13:29 [post_modified_gmt] => 2018-04-21 00:13:29 [post_content_filtered] => [post_parent] => 0 [guid] => http://mosesjewelers.com/?p=4721 [menu_order] => 0 [post_type] => post [post_mime_type] => [comment_count] => 0 [filter] => raw ) [queried_object_id] => 4721 [request] => SELECT wp_posts. * FROM wp_posts WHERE 1=1 AND wp_posts.post_name = 'yales-peabody-museum-showcases-stunning-rarely-seen-formations-of-california-gold' AND wp_posts.post_type = 'post' ORDER BY wp_posts.post_date DESC [posts] => Array (  => WP_Post Object ( [ID] => 4721 [post_author] => 1 [post_date] => 2018-04-20 20:13:05 [post_date_gmt] => 2018-04-21 00:13:05 [post_content] => One of the world's finest collections of California gold made its debut last Saturday at the Yale Peabody Museum of Natural History in New Haven, Conn. The exhibition features 23 natural formations of gold, some of which resemble leaves, coral and skeletons. The exhibition also gives Yale University an opportunity to remind visitors of the school's interesting connection to the California Gold Rush. Seven years before gold was discovered in the American River at Sutter’s Mill, Yale professor James Dwight Dana had completed a tour of California’s Sacramento Valley. 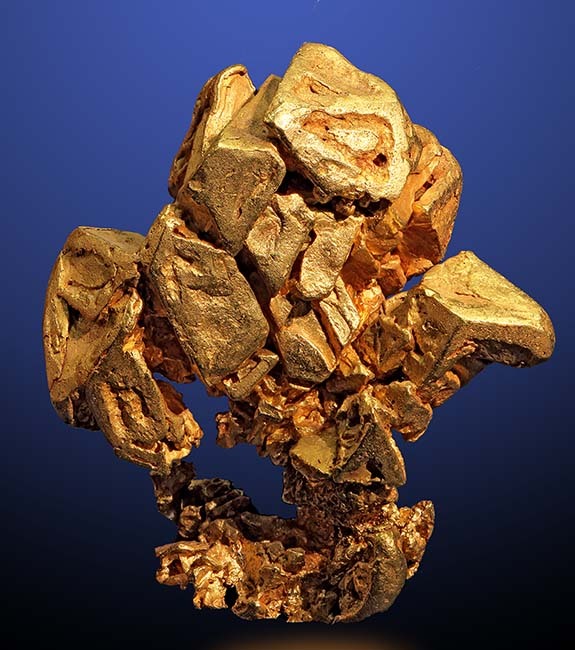 A pioneering geologist and mineralogist, Dana identified the region as a potential source of gold, remarking that the rocks there “resemble in many parts the gold-bearing rocks of other regions: but the gold, if any there be, remains to be discovered.” The gold specimens and artifacts are on loan to the Peabody from The Mineral Trust. The collection had previously appeared at the American Museum of Natural History in New York City. Credits: Photos by Harold Moritz, courtesy of Yale University. [post_title] => Yale's Peabody Museum Showcases Stunning, Rarely Seen Formations of California Gold [post_excerpt] => [post_status] => publish [comment_status] => closed [ping_status] => closed [post_password] => [post_name] => yales-peabody-museum-showcases-stunning-rarely-seen-formations-of-california-gold [to_ping] => [pinged] => [post_modified] => 2018-04-20 20:13:29 [post_modified_gmt] => 2018-04-21 00:13:29 [post_content_filtered] => [post_parent] => 0 [guid] => http://mosesjewelers.com/?p=4721 [menu_order] => 0 [post_type] => post [post_mime_type] => [comment_count] => 0 [filter] => raw ) ) [post_count] => 1 [current_post] => -1 [in_the_loop] => [post] => WP_Post Object ( [ID] => 4721 [post_author] => 1 [post_date] => 2018-04-20 20:13:05 [post_date_gmt] => 2018-04-21 00:13:05 [post_content] => One of the world's finest collections of California gold made its debut last Saturday at the Yale Peabody Museum of Natural History in New Haven, Conn. The exhibition features 23 natural formations of gold, some of which resemble leaves, coral and skeletons. One of the world’s finest collections of California gold made its debut last Saturday at the Yale Peabody Museum of Natural History in New Haven, Conn. The exhibition features 23 natural formations of gold, some of which resemble leaves, coral and skeletons. “The Mockingbird” measures 2.5 x 2.0 x 1.0 inches and features skeletal octahedral gold crystals stacked on minor quartz crystals. It was discovered at the Mockingbird Mine, Mariposa County, Calif.
“The Eagle,” which measures 2.5 x 2.5 x 2.0 inches, was mined in the 1850s in Placer County, Calif. 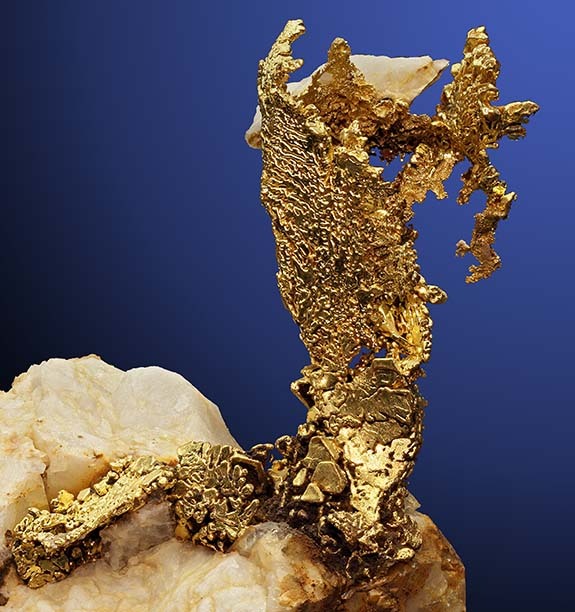 It features clusters of octahedral hopper gold crystals. “Colorado Quartz 2” measures 2.37 x 1.6 x 1.0 inches. The stacked gold exhibits sharp octahedral crystals with minor quartz. 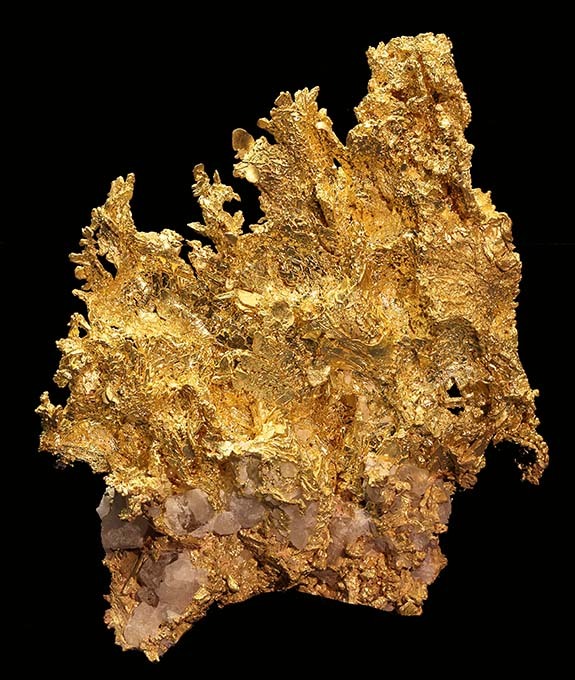 This specimen was found at the Harvard Mine in Tuolumne County, Calif.
“The Little Flame” is a crystallized leaf gold that weighs 13.05 troy ounces. It was found at the Eagle’s Nest Mine in Placer County, Calif.
“Colorado Quartz 1” measures 7.0 x 5.5 x 5.0 inches and weighs 58.68 troy ounces. 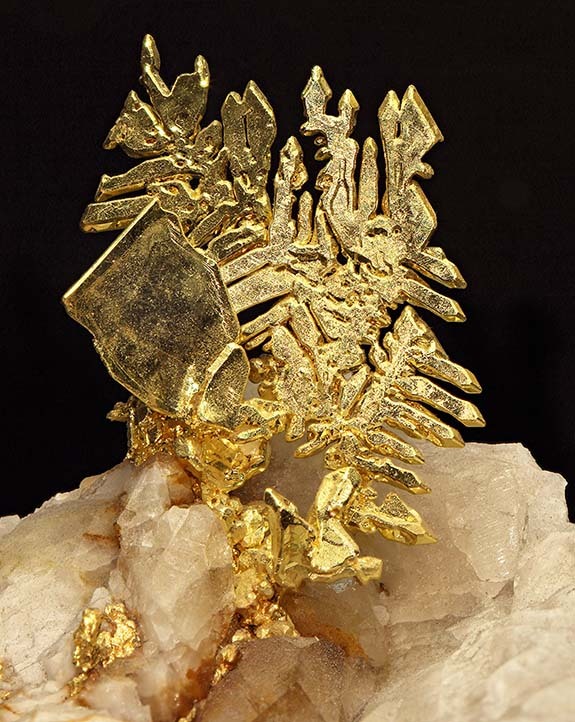 The piece has gold plates on and in quartz, octahedral gold crystals and dendritic gold. Its origin is the Colorado Quartz Mine in Mariposa County, Calif.